When you think about loud, heavy music, the first thing that comes to mind definitely isn’t online slot games. Yet, with the new range of rock and metal-themed slot games, developers have given fans the opportunity to enjoy music from their favorite heavy artists whilst having fun playing a unique online slot experience dedicated to their favorite musicians. When you think about it, music and gaming have always shared a close relationship. Even from the earliest video games you were treated to a unique soundtrack. Most of the soundtracks on retro video games may have been slightly irritating, but infinitely unforgettable chip tune theme tunes. But thankfully there are now gaming options for the rock and metal fans to enjoy. Whilst there are video games of all kinds cropping up to the sound of heavy metal, online slot games are going that extra mile with the unique dedication to artists. Judging by the popularity of the rock-themed online slot games, more players are being drawn in and trying online slots than ever. And it really is no wonder given the fact that music can control our emotions – so it’s the perfect component to add to the game for that added thrill. When fronted with an anthemic hit, our serotonin shoots through the roof. But even the slightest, most subtle tonal changes to music can influence our mood. Pair that serotonin hit with what you would get from playing an online slot game and what you’re treated to is pure raucous euphoria – with the chance of winning big money too! With stakes starting from as little as 0.01p you can have all of the fun for the fraction of what it would cost for you to see Guns ‘N’ Roses live in concert on their reunion tour. Whilst not everyone can front £120 for a ticket, or even worse £2,500 for a VIP pass where you don’t even get to meet and greet the iconic members, everyone can afford to grab a slice of the high-intensity action via the online slots. We’ve picked out five of the top rock and metal music-themed slots which will keep you entertained with some of the artist’s most popular songs to re-invoke the passion which you found for your favorite tracks. Of all of the loud-music themed slots, the Guns ‘N’ Roses video slot has to be the most iconic. NetEnt created a stunning, and strikingly immersive game through the 20-line slot which takes you right back to the simpler times of the 80’s when hair metal reigned supreme. Everyone has a favorite Guns ‘N’ Roses member. 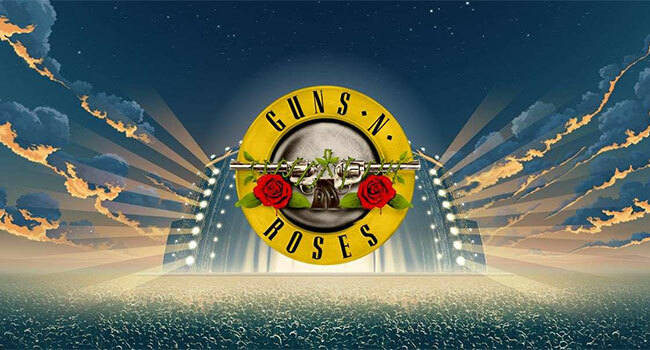 Whilst fans may not be able to agree on exactly who brought the talent to the table between Axl Rose and Slash, they have all been able to agree that the opportunity to play with all the members of Guns ‘N’ Roses is one of the top features. Through the progressive, yet simple to play slot game you’ll be able to soak up all of that iconic 80’s glamour as you work your way up to the jackpot prize. Playing on a budget? The with the minimum stake set to 20p on each line, it’s easy to play on a budget. You’ll also be surprised at how often the opportunity to grab some free spins crops up! For a time, it was believed that Motorhead was the loudest live band on the planet. Whilst that may not have been strictly true thanks to bands such as SWANS and My Bloody Valentine, the iconic outfit certainly gave their fans’ eardrums a run for their money. The Motorhead video slot was also designed by NetEnt to provide an experience like no other. The slot showcases and celebrates the British Hard Rock legend’s most seminal work – and yes, you’re bound to hear Ace of Spades blaring at some point during the gameplay experience. Along with the pumping soundtrack the five-reel slot offers up to 76 pay lines. Jimi Hendrix may not be as heavy as the other icons of rock and metal to feature on this list. Yet, no matter how many guitar heroes we see over the next few decades, it is unlikely that any will ever match up to Hendrix, so it isn’t all too surprising that Hendrix has his very own slot. NetEnt must have a fair amount of rock fans in their ranks because this is the third game on the list created by the online gaming giants. As you’d expect from a Hendrix slot, you’ll be welcomed into the psychedelic haze of the 70’s at the same time as being taken on an immersive ride. Whilst the game may be fairly similar to the Guns ‘N’ Roses video slot, as you’d expect the soundtrack is much mellower and transient riff-driven. It’s interesting to note that Megadeth had their own slot machine developed before Metallica. Is that enough to settle the age-old argument of which is the better band? Probably not. But either way, the popular online slot is packed with their most famous classic heavy metal soundtrack which is accompanied by some pretty wild symbols. There are also plenty of free spins that you can get your riff-loving hands on throughout the gameplay experience. Even players who aren’t particularly fond of the genre come back to the Megadeath video slot time and time again. If you’re tired of crazy, crazy nights and you’d rather curl up and enjoy the KISS online video slot game from the comfort of your home you won’t be disappointed in the progressive gameplay experience. With over 100 ways to win, the gameplay will be just as euphoric as the soundtrack of the glam rock band’s best hits from over the decades. Members of KISS will appear throughout the gameplay as you spin the reels which celebrates the band’s distinctive aesthetic. Reward your passion for gaming at the same time as indulging in your passion for the icons of sleazy rock on the five-reel slot. Report: Where’s the money in music in the 21st Century?